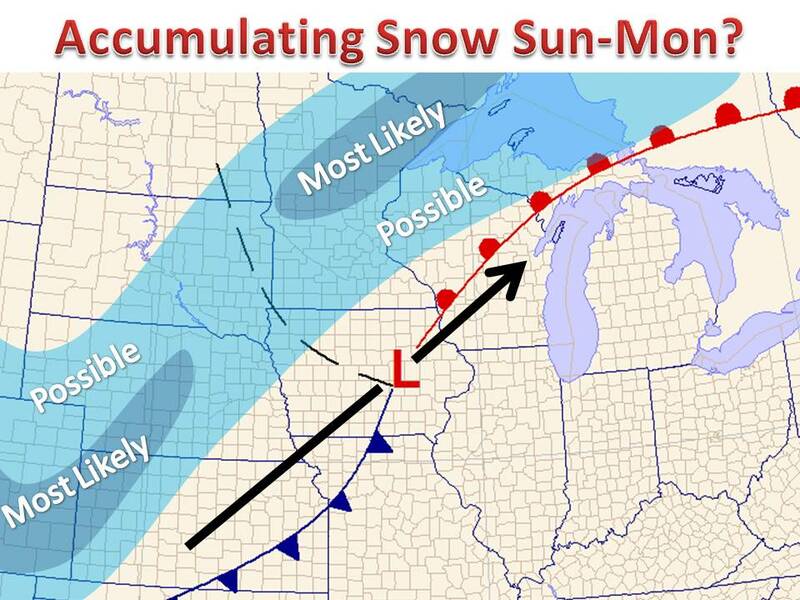 Midwest Winter Weather Blog: Winter's Last Stand? After a warm February, a warm March, April looks to wrap up with a shot for snow across parts of the Upper Midwest. High pressure to the north will usher in cool and dry air from the Canada, This feature will set up an ideal thermo environment for Mid-Spring snow around these parts. Coupled with a strong area of low pressure coming in from the south and west, confidence is increasing that someone will see several inches of snow Sunday or Monday. A safe bet for 6"+ of snow will be across Colorado into western Nebraska. The storm will then push north and east towards Wisconsin. As it takes this path, more cold air will be brought down from Canada, allowing for the likelihood of more snow in northern Minnesota. What happens in between is the question, but there certainly is a chance of at least a few inches of snow. Nonetheless, temperatures look to stay on the cool side through early May. However, there is a light at the end of the tunnel. Temperatures look to rebound by May 5th in the Plains, May 6th in the Upper Midwest, and May 7th in the Great Lakes.